Here's how to make your bike commuting route safer and more enjoyable. With thousands of accident-free bike commuting miles behind me over the years, I had long ago taken comfort in the idea that a little paranoia around cars keeps a cyclist safe. Be skeptical about the intentions or attention level of every driver you see, and you’ll be fine. But what about the drivers you don’t see? In a two-week period, I learned that two members of my church had been rear-ended while cycle commuting on local streets. Both riders are recovering now, but the parallels are disconcerting. Both cyclists were riding responsibly, and the dangers came from behind on medium-speed arterials. Coincidence? Auto danger by the numbers. 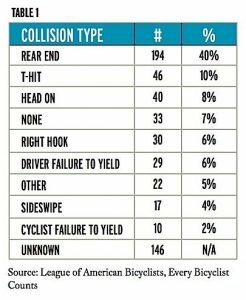 According to the League of American Bicyclists, nearly four of every ten auto/bike fatalities is a rear-end collision. Even adding together all the interaction-related incidents, rear-ends are more common. In the study, of 238 fatal crashes where drivers were blamed, 42% were careless or inattentive, 36% were hit and run, and 12% were drunk or drugged. Paranoia around cars is warranted. Even more clarifying was the comparison of road types. 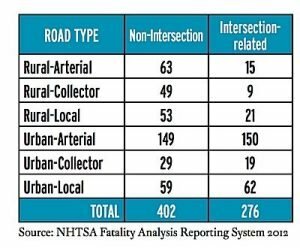 Urban arterials were by far the most dangerous roads, and in general, collisions were more likely to happen outside of intersections. Even armed with this data, I made no changes to my commute. I had assembled a familiar combination of bike lanes, sidewalks, neighborhood roads, and one 35 mph downhill on an urban arterial where I could go the speed limit in high gear on a CHANGE 611 folding hybrid. If anyone really needed to go over the speed limit, he could darn well pass me in the passing lane next to me. And then, one day, someone blew past me by a good 20 miles per hour in a black luxury sports car…without even leaving my lane. That’s enough to spook anyone out of a comfort zone! The potential for fatal collision on this route was now very real for me, and it was time to “car-proof” my commuting route immediately. But how? In brief, while Google Maps offers a biking option, there are far better ways to map a safe biking route. Here’s what Google Maps generated for my morning biking route across a busy part of the city. With this route, an eventual car-bike collision is almost a certainty. 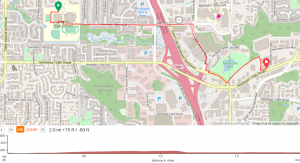 The last two-thirds of this route combines a steep downhill like the one I am now avoiding with perhaps the most dangerous biking road in my city–combining four lanes of high-speed drivers jockeying for position on and off the freeway. The last thing they are looking for or expect there is a bike in the road. A far better option is www.ridewithgps.com, even if you don’t actually ride with a GPS. You can draw and save routes directly on the map, avoiding the yellow roads (nasty, high-speed traffic), and the software automatically calculates elevation. 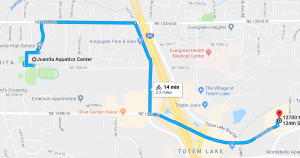 This route is shorter, safer, less nerve-racking, and ultimately a speedier bike commute! Even cooler, there’s a network effect. The more folks who use it, creating more routes, the more the safe streets get known through crowd-sourcing. 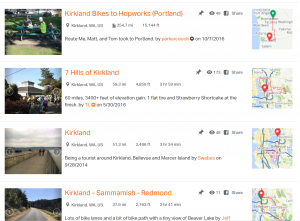 A quick search of “routes within 2 miles of Kirkland” resulted in over 6,500 hits on all kinds of rides. Tootle around town? Check. Cycle 250 miles to another state? Check. Sites like CyclewithGPS provide a valuable service. They steer riders toward safer routes, and expose the best routes for everyone to see and explore. If there’s no safe cycling route between your home and the rides you want to explore, you can see that early too. And that’s where we come in. Fold your CHANGE bike in half, drive it safely over unsafe roads, and then explore freely, for as long as your wanderlust takes you. See you on the (safe) roads!